Dealing with day-to-day pressures isn’t easy and that is a major reason why people are now looking to ways to de-stress, with yoga being the popular choice of the lot. Yoga is something most of us are familiar with, we may not be experts, but, we do have a general idea about what it is. But, now, some pretty crazy and out-of-the-box yoga trends that are both effective and fun are making their way into the public eye. The interesting aspect of them all is that they are extremely fun, if done in a group. Having said that, one should keep in mind to do them under expert guidance only. If you haven’t heard of them yet, this is your chance to get some insight into these insanely cool forms of yoga. Also known as cat yoga, it is a common belief that practicing yoga around cats will keep all the negativity at bay. It is also a great bonding exercise with your pet cat, that will join in your yoga sessions whether you like it or not. Like the name suggests, it’s where you get to drink beer while practicing yoga asanas. 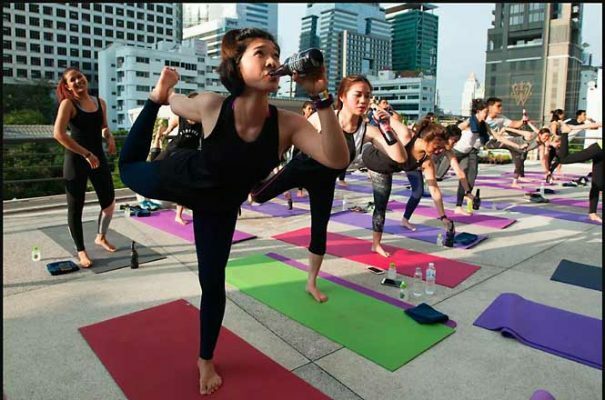 It combines the philosophies of yoga with the joy of beer drinking and gets you that much-needed relaxation. It isn’t binge-drinking or promoting drinking, but can be fun, if done occasionally. For all those animal lovers out there, here is another way to show your affection. Usually done in farms, this one needs you to practice yoga out in the open, while goats wander around you and sometimes, even climb on top of you. Regardless of the weirdness, the practice sounds super fun indeed! With professional and personal demands only increasing, this yoga trend enables you to tap into that inner child, giving you an opportunity to vent out that bottled-up anger and frustration in a healthy way. The practice encourages you to scream and shout till you feel all that anger leaving you. A recent fitness fad that’s gaining immense popularity, this trend is a cross between pole dancing and yoga, making it all the more fun. It helps build core strength and flexibility as it combines the strength and focus of yoga and the flexibility and fun factor of pole dance.